Liu astutely shows the reader how to save time and money by preparing a larger amount of chicken, and freezing the extras. But unlike other “cook ahead” books, you don’t get stuck eating the same dish over and over. Each time you want to use the chicken, you take out just what you need, and then make a fresh dish from among the recipes provided (and they are tasty!). Recipes are organized into well thought-out sections on “Salads”, “Soups and Stews”, “Sandwiches, Pitas, or Tortillas”, “Pastas”, “Rice”, and “One-Dish Dinners.” They cover the full range from the quick-and-easy staple (chicken salad sandwiches) to the wow-your-guests spectacle (chicken, rice, and mango lettuce wraps). The recipes for the chicken with red mole sauce and the chicken and chickpea stew are top choices that would each be well worth the price of purchase by itself. Sprinkled among the amazing recipes and practical tips are surprisingly interesting anecdotes and facts about—what else—chicken. Twice as Nice is a great read for the foodie who lives hard and works hard, but still craves great home cooking! 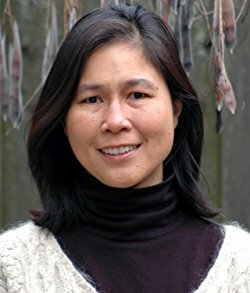 Sandra Liu’s level of sophistication and style has changed considerably from her days as an immigrant child with a taste for mixing cranberry sauce (from a can!) with soy sauce for the Thanksgiving dinner table, but her status as a bona fide home-cooking adventurer has not. Sandra’s unique culinary style is one cup pragmatic and two cups foodie splendor. She has the perfect recipe for the contemporary home cook who wants to put delicious and nutritious meals on the table without a hassle. So many great recipes to try. As I was flipping through the recipes, I was happy at how thorough the book felt. Don't get me wrong, each cookbook has step-by-step instructions, but this one felt more in depth detail than most. I also like that in the recipes, specifically the one I made, had fresh and prepared methods. So instead of soaking beans overnight, she had an alternate solution in canned beans. I tried the Broiled Chicken and Pepper with Hummus recipe. I didn't make hummus, but adapted the chicken method to make wraps. They were so delicious too, I ate 4 of them! 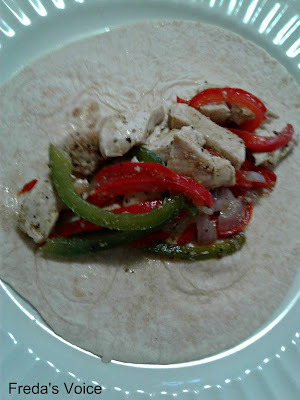 Flavorful, and quick to whip up, I am eager to try another recipe, or even use one to suit my tastes as I did with this one. I know I am going to have much fun with this book. 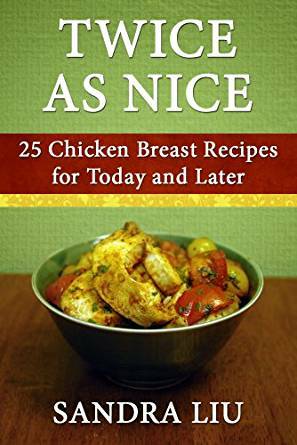 If you love chicken, this is definitely a cookbook for you! **Compensation may be earned from the links within. This copy was obtained free on Amazon Opinions and photos are owned by Freda's Voice.